Three wheeled kick-scooter-backpack, solidly built, super light and real fun to drive! A revolution in the way you'll get around! 199 backers pledged $87,764 to help bring this project to life. With your help, we will start production and launch the Floh, the ultra light kick-scooter-backpack designed to make your commute fun and clean. The Floh can be used in many ways. It can be worn like a backpack, pulled behind you, or transformed in a second and driven like a three wheeled kick-scooter. You can even detach the backpack and drive the kick-scooter separately. The Floh will solve all your traveling and transportation needs in a cool, fun and environmentally clean way. Get from the parking lot to your workplace or to the classroom. Zip through the airport terminal, glide to your local coffee shop, or anywhere else you may want to get to fast and easy. Our plan is to use Kickstarter's funding to produce two versions of the Floh: a Dark Blue one and a Dark Red one. The water resistant backpack is made of high density EVA foam and is ultra light and sturdy. 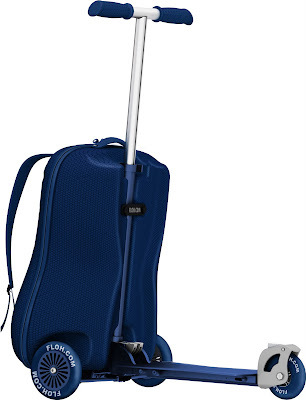 The Floh weighs 9.3 lbs (4.235 kg), fits into the overhead compartment of an airplane, yet has a volume of about 18 liters and can carry up to 220 lbs (100 kg). The wheels are robust inline-skating wheels and the extra wide board is designed to let both feet rest comfortable side by side. The Ackermann steering system will safely let you carve curves without letting you tip over and the brake makes this a safe traffic companion. The back-wheel fits snugly against the bag, but spins out 90 degrees when the board is folded down for driving. This makes the Floh both very compact when folded up and an engineering marvel when folded down. The Floh is unique, practical and extremely fun to drive! Have a look at Gregor´s 9 year old son driving it on update. With your sponsorship, we will produce the first Flohs and launch them in the US in August of 2012. Ø What are we trying to do? We are trying to launch Floh in the US. Ø How you will do it? We will use the Kickstarter funding to build the first 500 units to launch the Floh in the US. We'll use guerrilla marketing and advertising to raise awareness and garner support through social media and across all venues. Ø How the funds will be used? The funds will be used solely for the production, launching and shipping of actual Floh units to the end customer. All development work has been done. Ø Your qualifications to complete this project ? Gabriella and I have worked in film production for many years and are good at keeping within tight budgets and delivering quality product. We are used to managing large teams of people with a single goal in mind. This is no different. We will be diligent with the money and make every single dollar count to bring a fantastic product to the market. Gregor Bismarck is the original inventor of the Floh. Inspired by his son, whom he didn’t want to carry through airports after 12 hour flights, because strollers were checked all the way through, the idea slowly evolved. Gabriella Stollenwerck is head of distribution in the US. She helped streamline the production and is working on the marketing and advertising for Floh. Guccio Gilardini is the accountant for the company and does most of the contract work with the factories in China. Christopher Steppert is our China liaison. Carl Zhang our spokesperson at our drive module factory in Shanghai. Jerry Chen is our bag manufacturer in Guangdong. We have made 30 prototypes and steadily improved the Floh over the last 7 years. We now have a streamlined drive-module that is robust yet light and safe. We are waiting for the anodized color samples of the drive-module. We have the dark blue Eva bag and are waiting for the dark red bag. The interior of the bag is practical and well designed. We are working on the e-commerce site (floh.com). We have 22 molds for 111 parts that constitute the Floh and we are ready to produce the first Floh units once the final colors are right. The factory is ready with assembly space and is waiting for our order. Instead of circling the block and waiting for a parking space, Floh owners will park their cars further away, and drive their Floh to work. They will use public transportation with a smile. Avoid short taxi rides. Floh users will buy less bikes, Razor and backpacks because with the Floh they have all three in one, further reducing production pollution. Ø Will there be a Floh with a Pebble built into the handle bar? We love the Pebble E-Paper Watch for iPhone and Android and are trying to get answers from Eric and the Pepple team to examine the on possibly of licensing their product and either making a dashboard on the Floh handlebar to attach the Pebble or actually build it into the handle bar. Pledge one dollar, you'll be added to our mailing list and receive Backers Only updates which will give you a special behind the scene look at the process. Thank you in advance for your dollar. It means a lot to us! Thank you for your generous sponsorship of $10. You will be listed as a Bronze level sponsor on our website and get our Backers Only updates. We will also send you a 'Floh Sponsor' sticker. Thank you for this! Thank you for this wonderful $25 sponsorship gift. You will receive a Silver level sponsor listing on our website, plus a cool Floh T-shirt. For shipping outside the US, please add $8. Thank you for this magical number sponsorship. You will get everything the above sponsors got, plus a special Magic Number 43 Floh cap. This will bring you luck for the rest of your life because you deserve it! Please indicate your color choice when sponsoring: dark blue or dark red. For shipping outside the US, please add $8. Thank you for your support ! Your brilliant and very much appreciated sponsorship of $100 will list you as a Gold level sponsor on our website. You will get a sticker, a t-shirt, a cap and a special custom made Floh coffee mug. For shipping outside the US, please add $12. We thank you for your generous support. For $240, you will get one of the first Flohs sent to you - either in Dark Red or Dark Blue. You will also get a Platinum level sponsor listing, a Floh T-shirt and our eternal gratitude! US shipping included. Multiple Flohs: If you would like to order more than one Floh, please select this Reward and enter: $ 480 to receive 2 Flohs, $ 720 to receive 3 Flohs, $ 1100 to receive 4 Flohs, etc. etc. This also works if you've already pledged, by pressing the 'manage-your-pledge' button and changing your original pledge to this reward. You will be able to choose colors: Dark Red & Dark Blue once we reach our funding goal. You'll also get a Platinum level sponsor listing, a Floh T-shirt for each Floh you order and our multiple eternal gratitude! US shipping included. For $1000, we will send you TWO Flohs, one dark blue and one dark red. The Flohs will have your name engraved on them (please specify when sponsoring). Inside the Floh backpacks, you will find two lucky #43 caps and two Floh T-shirts. You will also receive Rock Star level sponsor listing on our website. Shipping included. For $5000, we will send you TWO Flohs, one month before launch. Your dark blue and dark red Flohs will have your name engraved and a special LED night-light limited edition bag. You will also get a special 'Thank You' banner on Floh.com as a 'founding sponsor'. Shipping included. Sponsor us so generously and you will be the first to own a Floh in the world! For a pledge of $10,000, you will get a custom-made Floh with your name engraved on it. This Floh will come equipped with a solar powered night light. The special luxury backpack will filled with fun and surprising gadgets. We will also make a special 'Thank You' banner that will fly across Floh.com's website. As special thank you, you will receive ONE Floh - free of charge - every December 1st to give to a loved one for the next 5 years! Shipping included.